BACKGROUND AND PURPOSE: Although thrombolytic therapy (recombinant tissue plasminogen activator [rtPA]) represents an important step forward in acute ischemic stroke (AIS) management, there is a clear need to identify high-risk patients. The purpose of this study was to investigate the role of quantitative permeability (KPS) MR imaging in patients with AIS treated with and without rtPA. We hypothesized that rtPA would increase KPS and that KPS MR imaging can be used to predict the risk of hemorrhagic transformation (HT). MATERIALS AND METHODS: Thirty-six patients with AIS were examined within a mean of 3.6 hours of documented symptom onset. KPS MR imaging was performed as part of our AIS protocol. KPS coefficients in the stroke lesion were estimated for all patients, and the relationship between KPS and both HT and rtPA was investigated by using Student t tests. Receiver operating characteristic (ROC) curves were computed for predicting HT from KPS. RESULTS: The occurrence rate of HT for patients who received rtPA and those who did not was 43% and 37%, respectively. Assessment of KPS in the lesion revealed significant differences between those who hemorrhaged and those who did not (P < .0001) as well as between rtPA-treated and untreated patients (P = .008). ROC analysis indicated a KPS threshold of 0.67 mL/100 g/min, with a sensitivity of 92% and a specificity of 78%. CONCLUSIONS: The results of this study indicate that KPS is able to identify patients at higher risk of HT and may allow use of physiologic imaging rather than time from onset of symptoms to guide treatment decision. MR imaging offers the option of selecting patients for treatment on the basis of physiology rather than time. When used in conjunction with clinical criteria, MR imaging−guided treatment selection could potentially lead to an increase in treatment eligibility, improved outcomes, and reduced complications. Development of physiologically relevant MR imaging, including diffusion and perfusion MR imaging, has improved characterization of ischemic tissue to the point where it is possible to identify viable tissue at risk (the penumbra). Re-establishing perfusion to the penumbral tissue has become integral to modern stroke management and new drug trials. The role of MR imaging as a physiologic imaging tool with the ability to characterize tissue injury continues to expand in clinically meaningful directions. For example, we have recently shown the feasibility of quantitative permeability (KPS) MR imaging16 to measure blood-brain barrier (BBB) disruption at infarct presentation in 10 patients with acute symptoms not treated with rtPA. Of these 10 patients, 3 showed HT within 48 hours. More important, the presence of significantly increased KPS was only observed in the 3 patients who later proceeded to HT. Although none of the patients examined in this study received rtPA, accumulating evidence suggests that rtPA therapy may amplify BBB disruption. In this study, we investigated the role of KPS MR imaging in patients with AIS (mean time to MR imaging of 3.6 hours from symptom onset) treated with rtPA when clinically indicated. We hypothesized that the presence of rtPA would increase permeability (KPS) and that KPS could be used to stratify the risk of HT. All studies were performed in accordance with the institutional guidelines for human research. All participating subjects (or their substitute decision-makers) provided written informed consent. Patients with a working diagnosis of AIS based on clinical assessment and CT findings were included. Additional inclusion criteria were onset of symptoms <6 hours to presentation (3 patients exceeded this time window by 0.5–1.5 hours) and successful screening for MR imaging safety. 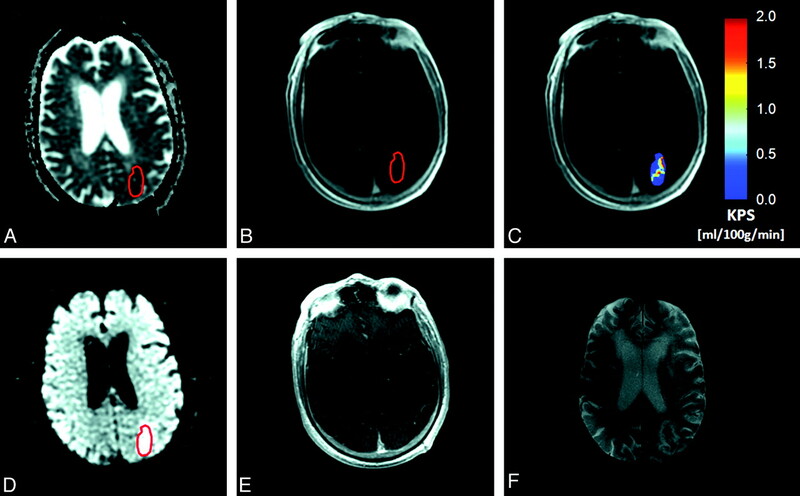 Patients with nonstroke lesions shown on CT, prior history of intracranial hemorrhage, uncontrolled hypertension, seizure at onset of stroke, known bleeding diathesis, and abnormal blood glucose levels were excluded. Thirty-six patients (18 women, 18 men; 27–93 years of age) with AIS satisfied the inclusion/exclusion criteria and underwent MR imaging within a mean of 3.6 hours of documented symptom onset. Stroke severity was determined by using the National Institutes of Health Stroke Scale (NIHSS). Fifteen patients received rtPA within a mean of 2.17 hours from symptom onset. The decision to initiate rtPA treatment occurred after the admission CT and before MR imaging for 9/15 patients. For 3 patients, the time of rtPA administration was not documented; for another 3 patients, rtPA was not administered until after MR imaging. Follow-up imaging was performed 24–72 hours later to assess HT by using either CT or MR imaging. These imaging studies did not include angiographic sequences; therefore, recanalization rates were not determined. Demographics and treatment characteristics of all patients studied are listed in the Table. MR imaging consisted of a comprehensive acute stroke MR imaging protocol including anatomic, whole-brain diffusion- and perfusion-weighted imaging of both hemispheres excluding the cerebellum, contrast-enhanced MR angiography, and high-resolution postcontrast T1-weighted imaging. In addition, a dynamic contrast-enhanced (DCE) 3D gradient recalled-echo (GRE) sequence was performed to assess KPS/BBB integrity. This scan was always obtained before both perfusion-weighted MR imaging and contrast-enhanced MR angiography (MRA). Each patient received a total of 3 × 15 mL doses of gadodiamide (Omniscan formulation; GE Healthcare, Milwaukee, Wis). Note that these data were collected before the 2006 US Food and Drug Administration (FDA) public health advisory statement regarding nephrogenic systemic fibrosis. We, therefore, no longer use this high-dose protocol in patients with poor or uncertain renal status, and we strongly recommend adherence to the most recent FDA guidelines on this matter (http://www.fda.gov/Drugs/DrugSafety/PostmarketDrugSafetyInformationforPatientsandProviders/ucm142884.htm). All subjects were imaged on a 1.5T clinical MR imaging system (Signa Excite; GE Healthcare), equipped with echo-speed gradients and an 8-channel head coil. Imaging parameters for the 3D GRE acquisition were as follows: FOV, 240 mm; 128 × 128 matrix, flip angle, 20°; section thickness, 5 mm; 12–14 sections; TR, 5.9 ms; TE, 1.5 ms. The total acquisition time was 4 minutes 48 seconds for a collection of 31 volumes at a temporal resolution of 9 seconds. The DCE sequence covered the entire infarct in all cases. Contrast media were injected as a bolus (5 mL/s) 30 seconds following the start of the 3D acquisition by using a power injector (Spectris Solaris; Medrad, Indianola, Pa). Data were transferred to an independent workstation for image registration and quantitative analysis. Image registration was performed by using an automated local affine model implemented in Matlab, Version 6.3 (MathWorks, Natick, Mass) to maximize mutual information between datasets.17 Parametric maps of KPS were calculated on a pixel-by-pixel basis by using in-house software (MR analyst, Version 1.3; University of Toronto, Toronto, Ontario, Canada). A unidirectional 2-compartment kinetic model was implemented to model the relationship between the tissue concentration of gadolinium-gadopentate dimeglumine (Gd-DTPA) (residue function) and the blood concentration time curve of Gd-DTPA (input function) by using linear regression as previously described by Roberts et al.18 For each voxel, the endothelial KPS transfer constant KPS was calculated as the slope of the best fit, and we assumed that the reflux of Gd-DTPA back into the intravascular space was negligible. KPS values were expressed in mL/100 g/min. The input function for all patients was obtained in the sagittal sinus, because a previous report by Ewing et al19 indicated that this vessel can provide a reasonable surrogate input function, with contrast concentrations matching data obtained from simultaneous sampling of arterial blood. A, A 50-year old female patient with acute ischemic stroke (AIS), visible as an area of reduced diffusion (dark region) on the apparent diffusion coefficient (ADC) map obtained at 4 hours 50 minutes post-symptom onset. Recombinant tissue plasminogen activator (rtPA) is administered during MR imaging. B and C, A region of interest is placed within the infarct, defined as the core area of reduced ADC, and then copied to the equivalent dynamic contrast-enhanced (DCE) image set (B), to generate permeability (KPS) maps (C). D, In this patient, the infarct region of interest demonstrates a positive slope of best fit with KPS = 1.59 mL/100 g/min. A region of hyperintensity is also visible on the equivalent postcontrast T1-weighted section obtained 20 minutes after completion of the KPS scan. E, Follow-up CT (obtained 48 hours later) shows an area of hypointensity characteristic of hemorrhagic transformation (HT) colocalized with the region of elevated KPS. Six patients in the rtPA group and 7 patients in the untreated group proceeded to HT. Among the 13 patients with HT, 2 were categorized as hemorrhagic infarction (HI1); 3, as HI2; 4, as parenchymal hematoma (PH1); and 4, as PH 2. ADC was reduced in all patients within the infarct zone, and the 1-way between-groups analysis of variance (ANOVA) did not reveal any significant differences (P = .61). When the groups were collapsed according to HT status at follow-up, the mean ADC measured in those who subsequently hemorrhaged was 603 ± 98 versus 626 ± 103 × 10−8 mm2/s in those without HT (P = .53). Collapsing the groups according to rtPA treatment did not reveal any significant difference in infarct-zone ADC (630 ± 90 versus 608 ± 109 × 10−8 mm2/s for treated and untreated groups, respectively; P = .52). Assessment of KPS in the lesion for all groups is summarized in Fig 2. The 1-way between-groups ANOVA did not reveal any significant differences (P = .55). 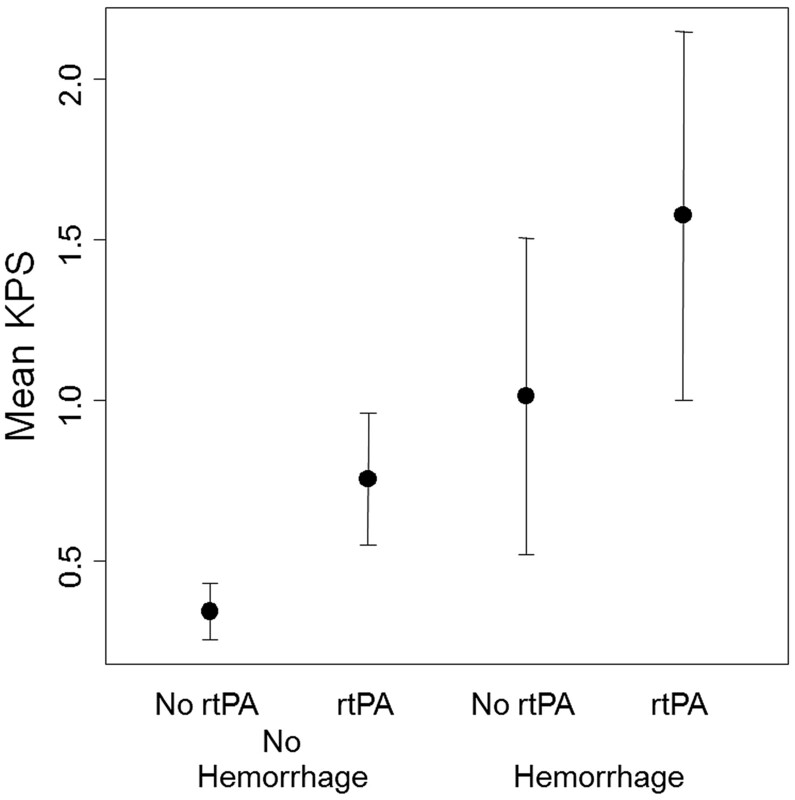 KPS within the infarct zone revealed significant differences between those who proceeded to hemorrhage and those who did not (1.27 ± 0.59 versus 0.50 ± 0.29 mL/100 g/min, P < .0001) as well as those who were treated with rtPA and those who were not (1.08 ± 0.39 versus 0.56 ± 0.45 mL/100 g/min, P = .008). The ANCOVA revealed that NIHSS was a significant covariate (P = .014) of KPS. However, NIHSS-adjusted means indicated that the mean HT KPS remained significantly greater than the non-HT KPS (NIHSS-adjusted P = .012; unadjusted P < .0001). A sample KPS map obtained in an rtPA-treated patient who progressed to PH1 is shown in Fig 1. Overall, mean KPS values were significantly increased in infarct regions of interest relative to the mean KPS values computed for the contralateral regions of interest (0.78 ± 0.56 versus 0.32 ± 0.24 mL/100 g/min, P < .0001). ROC analysis indicated a KPS threshold of 0.67 mL/100 g/min with a sensitivity of 92% and a specificity of 78% for identifying HT. In 3 patients, KPS exceeded this threshold despite no visible evidence of gadolinium enhancement (Fig 3). All 3 of these patients subsequently hemorrhaged (classified as HI1, HI2, and PH1). Overall, there were no significant differences in KPS between HI and PH subtypes (1.00 ± 0.43 versus 1.47 ± 0.60 mL/100 g/min; P = .13). Mean microvascular KPS values of the infarct obtained at the time of presentation for all patient groups. Significantly elevated KPS values are seen in patients who subsequently proceed to HT, compared with those who do not (P < .0001). Patients receiving rtPA also have significantly greater KPS compared with those who do not receive rtPA (P = .008). A, An 81-year old male patient with AIS, visible as an area of reduced diffusion (dark region) on the ADC map obtained at 2 hours 47 minutes post-symptom onset. B and C, rtPA is administered during MR imaging. A region of interest is placed within the infarct, defined as the core area of reduced ADC, and then is copied to the equivalent DCE image set (B), to generate KPS maps (C). In this patient, the mean infarct KPS is 0.84 mL/100 g/min. D and E, A region of hyperintensity is also clearly visible on the equivalent diffusion-weighted image (D), but not on the postcontrast T1-weighted image obtained 20 minutes after completion of the KPS scan (E). F, Follow-up T2-weighted MR image obtained 48 hours later reveals 2 “hotspots,” or areas of hypointensity, characteristic of HT colocalized with the zones of hyper-KPS on the KPS map. We investigated the role of KPS MR imaging, comparing patients who received rtPA with those who did not within a mean time to MR imaging of 3.6 hours from documented symptom onset. KPS was significantly elevated in patients who hemorrhaged, compared with those who did not. This was observed in patients who received rtPA and in patients who did not receive rtPA, suggesting that the compromise of BBB integrity plays a critical role in HT. Furthermore, ROC analysis indicated a threshold of 0.67 mL/100 g/min, which could be considered a physiologic threshold for decision-making regarding rtPA administration. However, a larger series of patients needs to be studied before clinical implementation of this threshold. Furthermore, there was insufficient statistical power to identify any effects of HT severity on KPS. Although follow-up evidence of petechial hemorrhage is unlikely to be clinically important, its existence on admission might portend an increased risk of secondary hemorrhage and might influence the decision to treat with rtPA therapy. 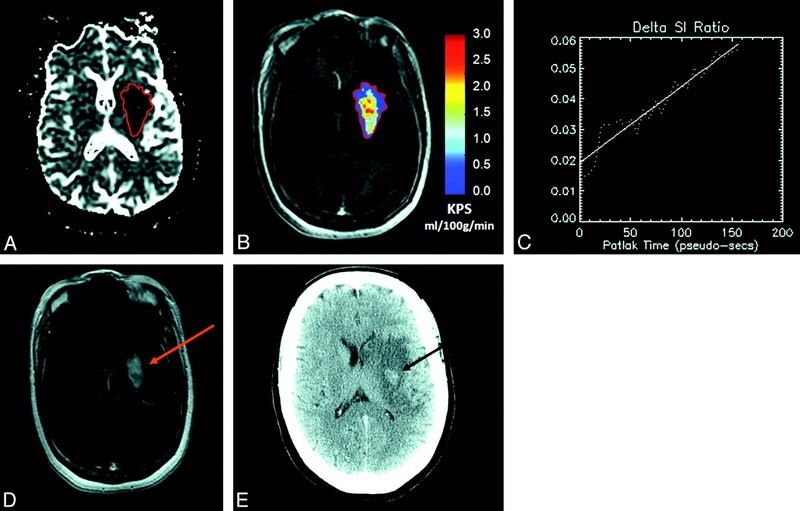 Several investigators have recently used DCE CT perfusion imaging for the evaluation of BBB KPS in patients with AIS.23–25 At potentially <1 minute in length, perfusion CT can be readily appended to the standard emergency CT evaluation for patients with AIS. Lin et al23 reported focal increases in KPS of >10-fold relative to normal parenchyma. However, a recent study by Dankbaar et al25 reported that KPS values derived from a 45-second CT acquisition overestimated those that were based on 3-minute datasets (7.6 versus 1.3 mL/100 g/min in AIS infarct regions of interest). In fact, the delayed or steady-state KPS estimates reported by Dankbaar et al were comparable with the MR imaging results presented here for DCE data (acquired in slightly less than 5 minutes). However, the acquisition of KPS MR imaging data is more feasible than CT acquisition due to improved contrast-to-noise. In addition, MR imaging has the advantage of capturing the entire spectrum of acute ischemic lesions from multiple small foci (invisible on CT) all the way to large vascular territory lesions (for which CT is equally good). The second piece of evidence is the clinical finding that patients presenting with AIS who are treated with rtPA have a 10-fold higher risk of HT (National Institute of Neurological Disorders and Stroke [NINDS] trial).4 Current treatment options, however, do not use patient-derived physiologic information for guiding therapy. Rather, therapeutic decisions are based on epidemiologically derived timing parameters, clinical presentation, and an imaging study, usually CT, to exclude the presence of hemorrhage. At our institution, patients undergo an initial noncontrast CT before MR imaging. This CT scan serves 2 purposes: to exclude the presence of nonischemic pathologies such as primary brain hemorrhage and to screen the patient for metallic objects. Safety for MR imaging can, therefore, be ensured and expedited without having to interrogate potentially language-impaired patients or relatives who may not have this important information. On the basis of the clinical presentation and this noncontrast CT scan, a decision is made to treat with intravenous rtPA. Exceptions to these guidelines may include patients such as the 3 included in this study in whom the noncontrast CT was inconclusive and the MR imaging performed immediately thereafter revealed AIS, enabling decisions regarding rtPA treatment. If, however, rtPA treatment is selected before MR imaging, then rtPA is delivered via an MR imaging−compatible infusion pump. Although the full impact of rtPA on KPS could not be assessed in the current study, a previous report indicated that parenchymal contrast-enhancement (visible on T1-weighted MR imaging) within 30 minutes of rtPA treatment was strongly associated with symptomatic HT.29 However, we observed elevated BBB KPS (ie, infarct KPS >0.67 mL/100 g/min) in the absence of visible enhancement in 3 patients who subsequently hemorrhaged, suggesting that static subjective assessments may be less sensitive than quantitative measures of BBB integrity. KPS evaluated within the first 4 hours following symptom onset is a significant predictor of HT. This work also revealed that the KPS measured in patients who received rtPA was significantly greater than that in untreated patients. With further validation of our findings, we believe that KPS values could help to stratify the risk of secondary hemorrhage. Our current data suggest that the risk would be low for patients with KPS values <0.67 mL/100 g/min and significantly higher for those with KPS values >0.67 mL/100 g/min. The patients with AIS who would potentially benefit the most from image-guided risk stratification are those who are otherwise excluded from rtPA therapy because they present for treatment beyond the current fixed 4.5-hour time window or those in whom the time of onset is unknown. Low KPS values in such patients would argue that rtPA administration is safe. We thank George Tomlinson, who provided statistical support for this project; Nataly Kogan, who helped with patient recruitment; Wael Rammo, who developed the software tool used for this project; and Rebecca Thornhill, for helpful comments during the revision of the manuscript. Previously presented in part at: 15th Annual Scientific Meeting of the International Society for Magnetic Resonance in Medicine, May 19–25, 2007; Berlin, Germany. This work was funded by the Canadian Stroke Network, the Canadian Institutes of Health Research, and the Canada Research Chair Program. Accepted after revision May 19, 2009.